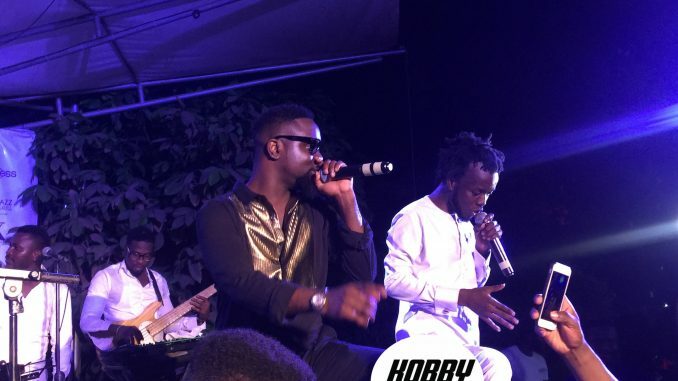 PICTURES: AKWABOAH’s “SHADES OF LOVE” WAS A SUCCESS. Akwaboah Hosts Couples To A Romantic Evening With Show Dubbed “Shades of Love” at the +233 jazz Bar in Accra . February, is considered the month of love and in this month, many people tend to show special love and affection towards their loved ones. Sensational singer/songwriter, Akwaboah, last night, showed his special love and affection for the people of Ghana at his talked about show; Shades of Love. The show witnessed a mammoth crowd trooping in to have a romantic evening with their loved ones. It was a wonderful show as love was greatly felt in the atmosphere. The host of the evening was K.O.D who did a very good direct the ‘atmosphere of love’ to be felt by all as the driver for the event present before the billed acts could take over the show. The event witnessed performances by Okyeame Kwame, Adina, Efya, Epixode, Becca and the evening was climaxed by a performance by Sarkodie. Akwaboah who is considered as the Ghanaian John Legend because of his vocal gift and talent behind the piano also thrilled patrons to a very romantic evening. His fan base AkwaNation was there to support alongside SarkNation. The musicians were backed by Patch Bay Band.